Words are sometimes hard find when a friend or loved one passes. Often, flowers better define the sympathy we feel for the family and our lost friend. 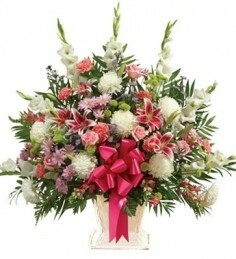 GENE'S FLORIST & GIFT BASKETS can help you communicate your feelings through flowers. From a small memorial urn to a lush standing spray, this simple gesture of support can mean a lot to a grieving family. Whether you need delivery to a house or a funeral home, GENE'S FLORIST & GIFT BASKETS can help with all sympathy flower needs. Casket sprays offer a final tribute to a departed loved one. It's beauty and elegance sets the tone of the funeral service. There are two types of casket arrangements: full couch and half couch. Full couch is for a closed casket, and half couch arrangements are typically used for an open casket. Flowers for cremation services are also available. For any type of funeral flowers in the Germantown area, GENE'S FLORIST & GIFT BASKETS is here to help. Flowers serve as an inspiration and a tribute to friends and loved ones during trying times. Cremation urn and memorial flowers can act as a personal expression of love or as a warm send-off. When you work with GENE'S FLORIST & GIFT BASKETS, we endeavor to illustrate the essence and memory of your loved ones with a beautiful floral expression of their lives. Our selection of floral inspiration covers a wide variety of personalities and tastes. Looking for something different, or want to add a personal touch? We also do custom arrangements. Call for pricing.